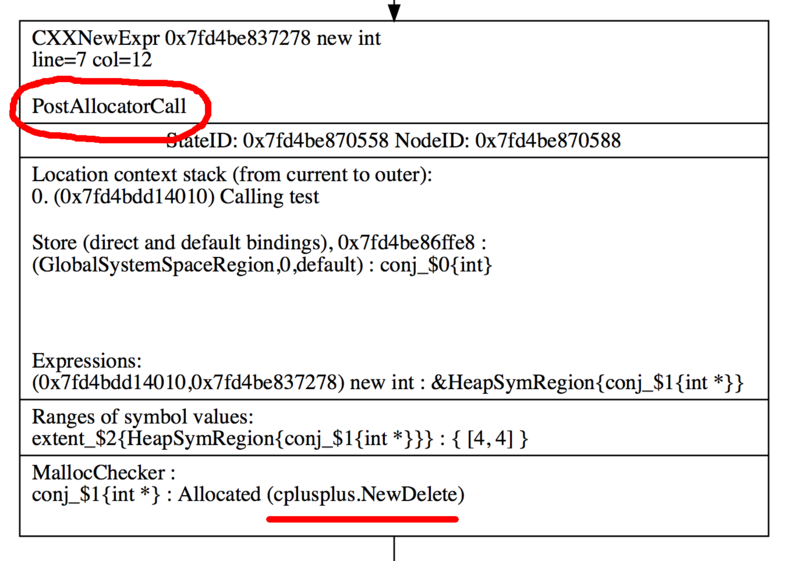 ⚙ D41800 [analyzer] Use a custom program point for the check::NewAllocator callback. [analyzer] Use a custom program point for the check::NewAllocator callback. Authored by NoQ on Jan 5 2018, 5:49 PM. 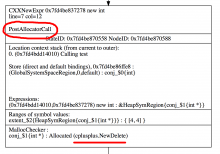 rC322796: [analyzer] operator new: Add a new ProgramPoint for check::NewAllocator. rL322796: [analyzer] operator new: Add a new ProgramPoint for check::NewAllocator. rG1c64e617f572: [analyzer] operator new: Add a new ProgramPoint for check::NewAllocator. This addresses a TODO from D41406. I re-used PostImplicitCall program point when calling the new callback, but it indeed causes problems: because implicit call has no associated statement, MallocChecker was unable to put visitor diagnostics over these nodes. Create a new class of ProgramPoint, namely PostAllocatorCall, which is a sub-class of StmtPoint, and use that when calling the callback. This patch might cause slight conflicts with D41150. Can we get rid of the TODO now? Maybe = default is getting more canonical within LLVM? But that would not match the rest of the file, so I am fine with not touching this. I think this is fine for now, but I wonder if in the future it would make more sense to have a getName or similar method for ProgramPoints. Yeah, i guess i'd do a separate cleanup for these things. Not even a minor concern for this patch, but I think that placing //RUN and //CHECK after the code being tested could save us from massive changes of line numbers. Hmm, not sure if i understand, you mean before the code? (it would save us from line number changes in plists, but it'd make the tests harder to read because you'd have to scroll all the way down through the plist to find the actual code). I mean placing RUNs after the program code (but before // CHECK. Anyway, moving RUNs below will cause... line changes so it is not an important issue. Hmm, yeah, right, maybe. So there would be no line number issues until we stick a test in between two other tests or modify existing tests. But i'm still too used to having RUNs above everything, i guess, to just quickly figure out what does the test do. Also it's not hard to regenerate line numbers (even if it looks scary).